Alan Edwardes has released a new style for Mint based on my original Pepper Mint Style; Dark Pepper Mint. Based on the original Pepper Mint Style for Mint 2, this theme has a darker touch to it. Richard Herrera has a great little hack for Mint that changes Mints stylesheet on the iPhone allowing you to have the multi-column look in your desktop web browser and a single-column on your iPhone. Read Richards guide at his site. The hack is simply to change a couple of lines in the head.php file, instructions on Richards site. Please let me know if you have tried this and it works, I unfortunately can’t test this over here in the UK. Update: With Richards approval Shaun has made this into a pane-less Pepper. No more hacking! iPhone Pepper v0.02. 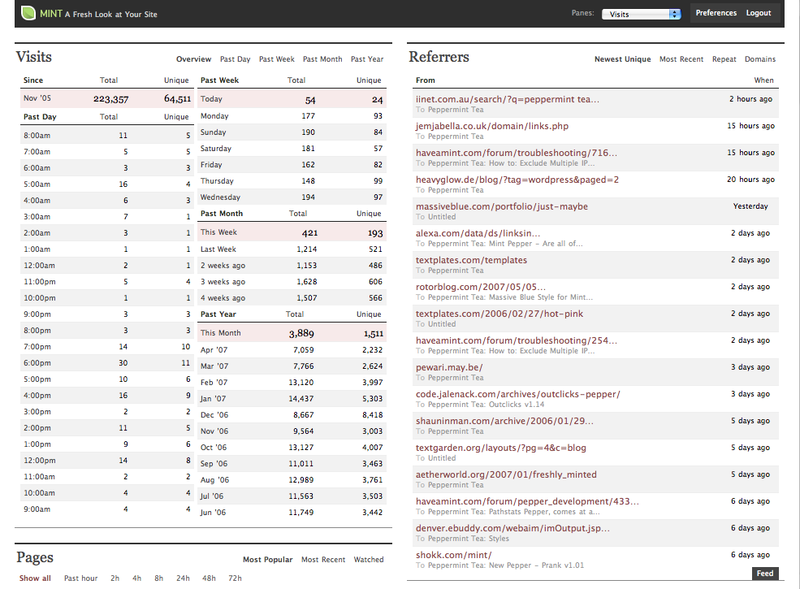 Rob Goodlatte has created a new style for Mint 2.0, Tufte. I’ve just finished and released a new style for Mint 2 called Tufte Mint. It’s inspired by Edward Tufte’s book The Visual Display of Quantitative Information. Mike from Flammable Animals just reminded me today that I had yet to update my Mint Styles to include the Search Button that is used by Shaun Inmans updated Secret Crush Pepper. Both Styles have been updated to Version 1.03 with the included image.